Professional MySQL Backup Software Replace MySQL Workbench - Data Export. 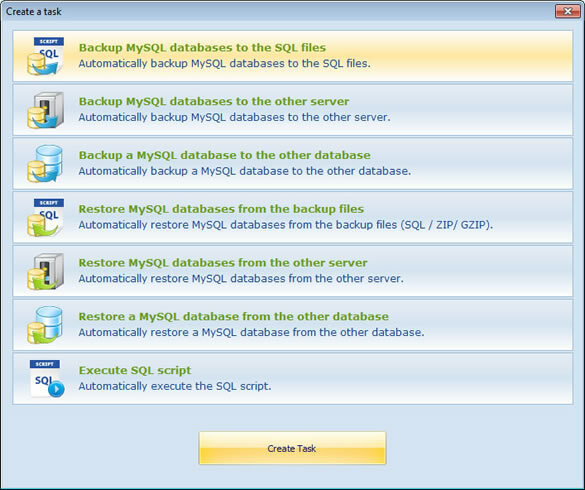 Professional MySQL Backup Software - Automatic Backup Scheduler for MySQL VS. MySQL Workbench. Automatic Backup Scheduler for MySQL > Tutorials > Professional MySQL Backup Software VS. MySQL Workbench. Professional MySQL Backup Software VS. MySQL Workbench. MySQL Workbench is a powerful but complex MySQL database management software. You can use it to design database, modeling, create and manage your databases. But if you just want to back up or export / import databases, these functions are redundant for you, you just need a professional MySQL backup and recovery software. 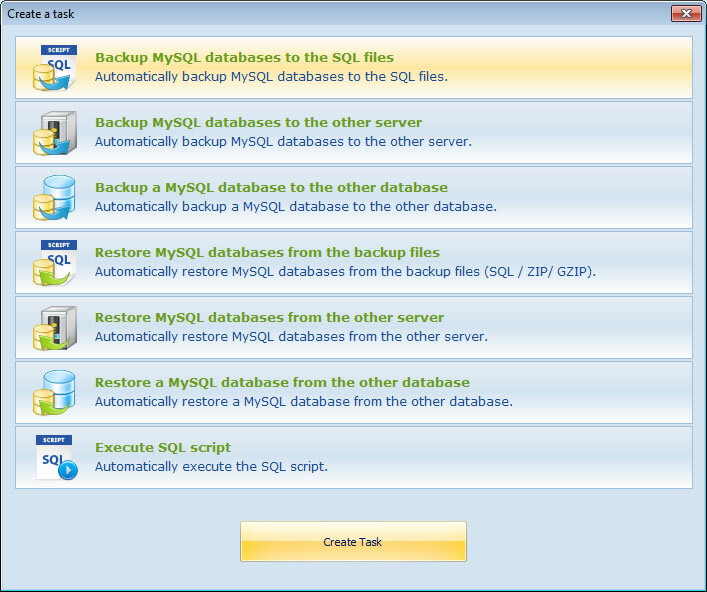 Automatic Backup Scheduler for MySQL is an easy-to-use and professional automated MySQL backup and recovery software. It can be used to back up MySQL database to the SQL files, the other MySQL server or database on schedule, and it supports Full Backup, Incremental Backup and Differential Backup. You can compress and password MySQL backup files, upload them to your FTP server or Email box. With Windows Service function, you do not need to log in Windows system for scheduling backing up and restoring. Let's look at the features of Automatic Backup Scheduler for MySQL and MySQL Workbench.